Readers with a mid to long term memory might recall ‘lawontheweb’, which featured in a naughty step post (and indeed a Guardian article) in 2012. Behind lawonetheweb was Brad Askew. Despite my best attempts at the time, Brad didn’t respond to any of my attempts to contact him. I looked. Oh dear. It appears that Brad just can’t help doing the same thing. Let us take a few examples. From the FAQs here “What can I do if my landlord has not given me information of the Deposit Protection Scheme my deposit is registered with?”. If after fourteen days of your landlord receiving your deposit, you have not been provided with information on the Deposit Protection Scheme you may take court action by applying for a court order. As a tenant you have the right to seek compensation if your landlord does not provide you with information about the Tenancy Deposit Protection Scheme used, or if your deposit has not been protected by either an insurance-based or custodial scheme. If the court finds that the landlord has not entered into a Tenancy Deposit Protection Scheme, the court will also order that the landlord pays the tenant an amount equal to three times the initial deposit amount, within fourteen days. No. Wrong, wrong wrong. Not even remotely right since April 2012. The landlord is not able to increase the rent during the initial fixed term, which is usually six or twelve months, as the rent is fixed during this period. During the first six months of the tenancy, excessively high rents under an Assured or Assured Shorthold Tenancy can be referred to the Rent Assessment Committee. Wrong. The rent can be increased if the tenancy agreement includes an appropriate rent review clause. Or what to make of this? “Tenancy Deposit Compensation Claims“, written by – lo! – an undergraduate at UWE, as indeed it appears much of Brad’s site is. I have asked UWE whether this use of their logo was agreed but haven’t heard back. This tenancy deposit post is well meaning, but not exactly accurate. It does not give any details of what prescribed information must be served within the 30 days. And does not state that failure to serve the prescribed information by itself means that no s.21 notice can be served, or that a claim for the return of the deposit and 1-3 times penalty made. Unlike the claim for a deposit this is a part 8 claim and therefore does not fall under the small claims category, meaning an action for compensation will require an additional application. A tenant taking this route would of course incur court costs and perhaps legal fees if they seek representation, however given the court decides in the tenants favour it will hold the landlord accountable for these. There is no ‘additional application’, there are court costs yes, but then so there are on the small claims track. And it is silent on costs risk to claimant. Confusing and inaccurate advice. When a tenant has legally surrendered the tenancy, then the landlord has the right of possession of the property under Section 5 of the Housing Act 1988. Nope, surrender is a common law matter. Either there has been a surrender and the landlord has possession or there hasn’t. HA 1988 has nothing to do with it. This type of surrender involves the tenant signing a “Declaration of Surrender”. This written document then acts as proof that the tenant has given up possession of the property to the landlord. Oh hell no. Either the tenant has surrendered (and landlord accepted) or they haven’t. If they haven’t – say the tenant remains in the property – then a ‘declaration of surrender’ is meaningless. The site also doesn’t believe in the existence of statutory periodic tenancies. An Assured Shorthold Tenancy entitles the landlord to a possession order immediately after the initial agreed period, which is usually for six months. The landlord is therefore able to evict the tenant after the initial fixed term without a legal reason. If this is the case and the landlord does not wish to renew the tenancy then they are obliged to give at least two months’ notice to end the tenancy. However, if both the tenant and landlord are happy with the agreement another tenancy can be agreed, for a new fixed period. Here at ‘SPEAKERS’ CORNER’ we have brought together a specialist panel of landlord experts who blog regularly about all things to do with starting, managing and ending a Tenancy Agreement. Join the conversation! Join the conversation – There are more than 600,000 people listening on here! Well, there are 3 solicitors who have added posts from the start of the blog, but the largest single contributor by far is ‘Brad Askew’ (actually a different UWE law undergraduate each time). “Specialist panel of landlord experts” would be putting it a smidgen too high overall. As would “600,000 people listening” as the entire site has an estimated 655 unique visitors a day, according to traffic monitors. Off by roughly a factor of a thousand? To help our 500,000 annual users we have partnered with Just Answer who have a panel of online lawyers, (solicitors and barristers) who are ready and waiting to help you 24/7. With law firms charging from £150 an hour this service is extremely popular because it is Quick, Cheap (£about £22), but still Verified Legal Experts. You do not pay unless you are satidfied [sic] with the service. Just Answer? My my. I have looked at Just Answer before and I have seen some utter rubbish peddled as landlord and tenant advice on that site, by a ‘barrister’. In fact, the question linked to in that tweet came via Tenancy Agreement Services, so this was one of Brad’s customers. And what they got for their money was hopelessly confused, irrelevant and wrong advice. But no matter. They are a lawyer after all. And if their advice is seriously wrong and I rely on it, I don’t have to pay the £26 (or whatever). A few questions about the Tenancy Agreement Service Site, if I may. Who checks the material on the TAS site for legal accuracy and what is their experience in landlord and tenant law? How often do you (or someone on your behalf) review the materials on the TAS site for continuing legal accuracy? Are TAS insured for giving wrong advice? Your FAQ and advice pages are quite definite. But some of them are very wrong. What happens if somebody relies on your advice pages? 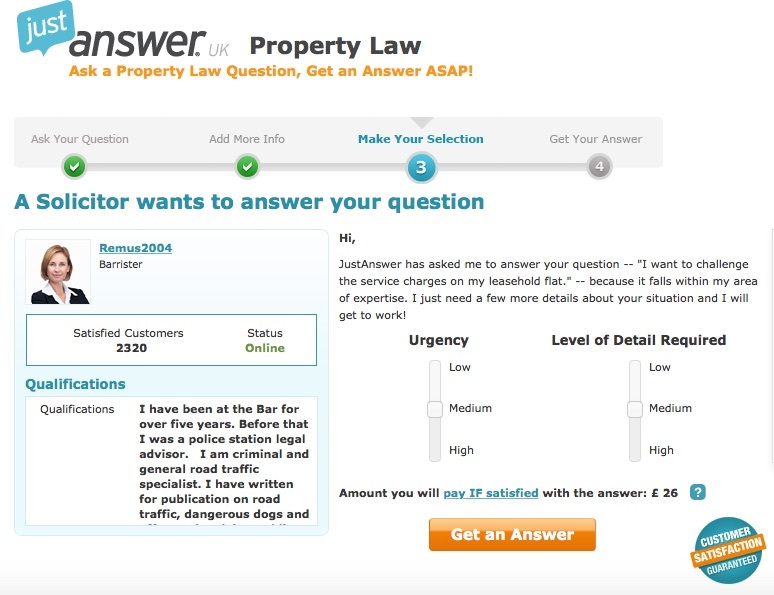 Your ‘legal advice’ page (https://www.tenancyagreementservice.co.uk/legal-advice ) says that you have ‘partnered with Just Answer who have a panel of online lawyers, (solicitors and barristers)’. Have you carried out any investigation of the service provided by Just Answer? I put a landlord and tenant question and got a ‘Road traffic offences specialist’ volunteering to answer my question. I have also seen inaccurate landlord and tenant advice by non-practising barristers (who do not describe themselves as such). Please be aware that I am writing a piece for publication on Tenancy Agreement Services and that your reply may be published. And, so far, silence. I’ve given Brad 6 days. I’ll unlink now, but any words from Brad will be added. So, for continuing to provide poor and inaccurate legal content, and for still getting landlord and tenant law quite a bit wrong, Brad gets to stay on the naughty step. Posted in Housing law - All.